Our client is a global coatings manufacturer. Their Guangzhou operation produces a range of high quality colour matched coatings for consumer electronics, primarily mobile phones. Mobile phones are an extremely dynamic market. Model lives are extremely short and colours and designs change constantly. The small size of the product means that paint volumes are extremely low, however, the appearance of a mobile phone is critical. Therefore, the requirements for sophisticated finishes, special effects and tight colour match tolerances is comparable to the most demanding automotive industry customers. Mobile phones are manufactured by a range of subcontract manufacturers, who have built flexible supply chains using lean manufacturing processes to meet the dynamic needs of this industry. Materials are ordered with daily Kanban orders. Unfortunately, the old batch production model of paint manufacturing is not suited for short lead times, Kanban and rapid product change. Our Client had improved their lead times, but they were still around five days on average. 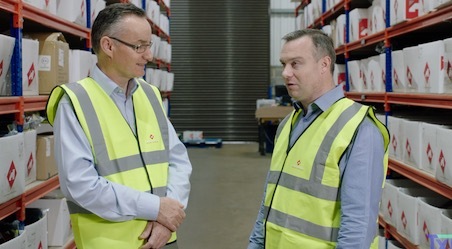 To meet these lead times Our Client often made the decision to hold stock of colour product, with no guarantee that the customer would take that stock. As a result, the business had high finished goods stock and a very high rate of stock write off due to obsolescence. 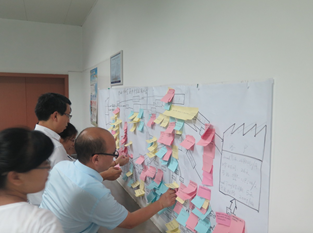 TXM mapped the end to end process for manufacturing of consumer electronics finishes using our unique approach to value stream mapping, the Manufacturing Agility Process. This included all the business processes from receiving and processing the customer order, through dispensing materials, production, colour matching and quality checking to receiving the batch in the warehouse and shipping of the goods. This identified opportunities at every step of the process to eliminate waste and reduce lead time. TXM coached Our Client to develop new processes to reduce lead time in all these processes. Follow up visits by TXM made sure that the processes were understood and implementation issues addressed. The evidence is best understood by a walk through our client’ warehouse. Shelves that were once filled with finished goods, much of it obsolete, were now empty. The bottom line is what matters– the lean manufacturing project had reduced inventory by 50% and lead time by 60%. This had enabled Our client to compete effectively in an increasingly competitive and dynamic market segment. Significant productivity gains had also been made in the processing, colour matching and QC checking of batches, which, in an environment of rising costs, all contributed to improving competitiveness. Inspired by the work in the consumer electronics business in Guangzhou, Our client is now planning to transfer the learnings to other plants and other product divisions throughout China.